It was really the DWST08210 L-Cart that made the whole system worth it for me. All of the different modular systems on the market are very similar in function, but they differ in design. They are all stackable and can lock together in any order, and they all offer transportation carts. The ToughSystem, however, is the only system that can load and unload the boxes in any order from a cart without having to unstack the boxes. If I want the box on the bottom, I can simply slide it out. How is this possible? The L-Cart has adjustable brackets that hold and suspend the boxes in mid-air. The brackets do a good job of holding the weight of loaded boxes even though they are made of plastic, though for the price of the L-Cart, I expected them to be made out of metal. Handles on the sides of the boxes hold them onto the L-Cart brackets during transport and there is little worry of them somehow jumping off. If you wanted a bit of extra holding security, there is a lever on the back of the L-Cart that can be engaged to latch each box to the L-Cart. 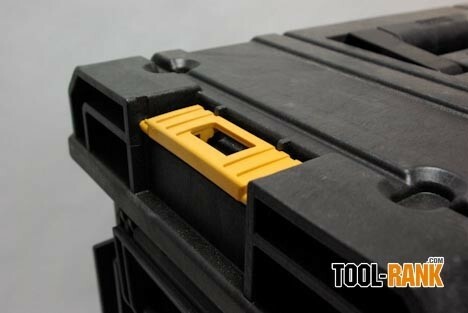 If that is still not enough, you can add an actual lock onto the lever, to lock each box to the L-Cart. Even though the boxes can be locked to the L-cart I would not trust it for long term security. After close inspection I noticed that it could be possible to slide the boxes out of the latch mechanism if the bracket that holds the boxes is broken and removed. The main body of the L-Cart is made out of metal. It is pretty beefy and should be able to handle jobsite abuse. The side rails have holes that are spaced along the height and these are used to hold the adjustable brackets in place. You can move the brackets, or add more brackets to match your box needs. One really nice feature of the L-Cart is the ability to fold up the tongue without the need for tools. This feature saves a lot of space in the back of the truck. The back handle can also be somewhat folded down, but it requires tools. The specs list the L-Cart as being able to handle material up to 260 lbs., but I am not sure if they are referring to the tongue of the cart or its total weight limit. I know that it had no problem handling all of my tools. 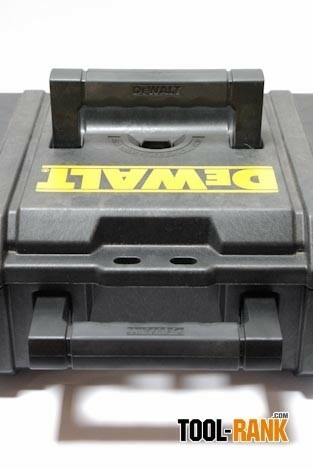 DeWalt has three different sized ToughSystem boxes that can easily be mixed and matched with the L-Cart to fit your particular needs. Design wise, the boxes are pretty much the same on the outside, with handles on both sides and one on top. The smallest box has an added handle on the front which allows it to be carried like a briefcase. All of the handle positions work well and are comfortable to use; the side handles make it especially handy to carry boxes that are loaded with a bit of weight. 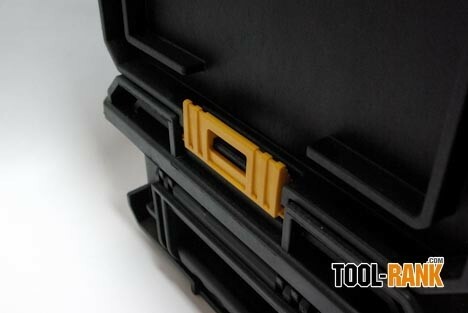 The ToughSystem boxes are constructed out of 4mm thick structural foam, which is the same material that Pelican boxes are made out of. 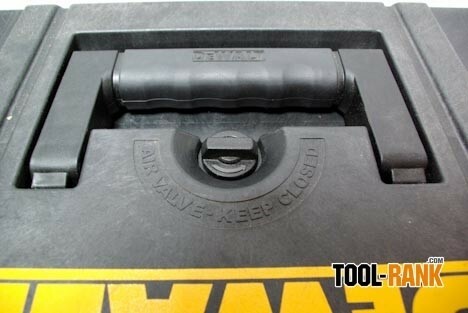 Each box also features an air tight seal and thus also requires a pressure release valve. 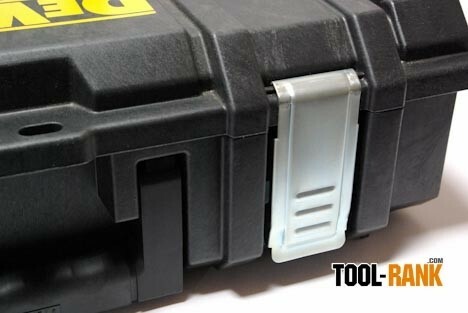 Two all metal latches ensure that each box maintains a good air and water seal. Because the latches are using compression to maintain the seal, there is back pressure on them that requires more effort to unlatch them. Pelican has a great latch system that requires mush less effort, and the ToughSystem would do well to have a similar latch. Each box also has a place to add a lock, but they are not reinforced with metal, so I would not trust them to hold off a break in for very long. 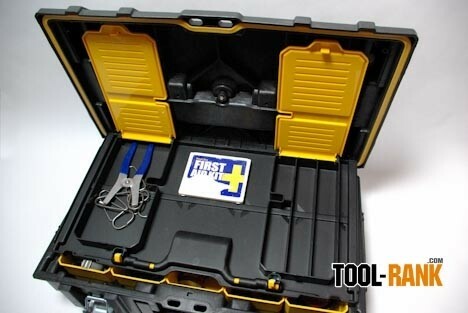 The smallest of the ToughSystem Boxes is about the same size as a standard cordless tool toolbox and measures roughly 21-1/2"W x 12-1/2"D x 6-1/4"H outside dimensions. 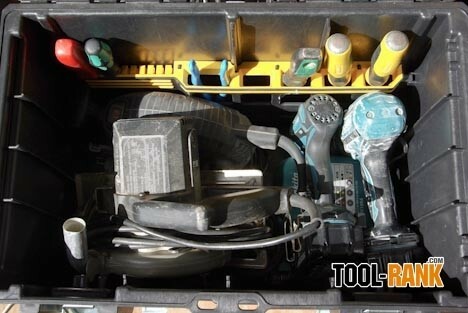 It can be used as a small power tool case, but it includes a total of 8 small parts containers that also make it a great jobsite screw box. 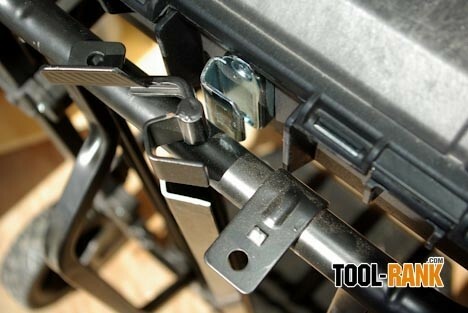 Of course there is also the option to remove a few of the small parts containers and use it for both at the same time. 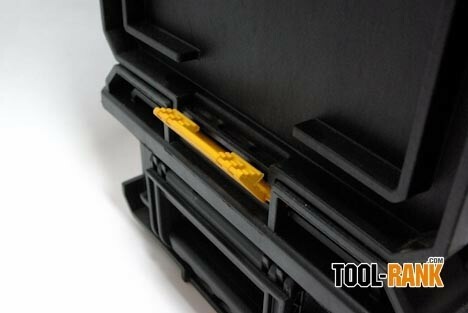 The lid of the DWST08201 also has a built in small parts organizer. 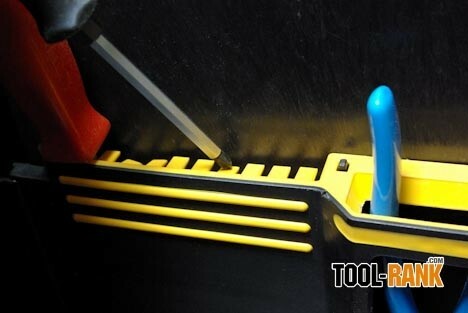 A latch releases this extra compartment which has lidded dividers that can hold drill bits, pencils, etc. There is also some room between the dividers where I have been keeping my small first aid kit. 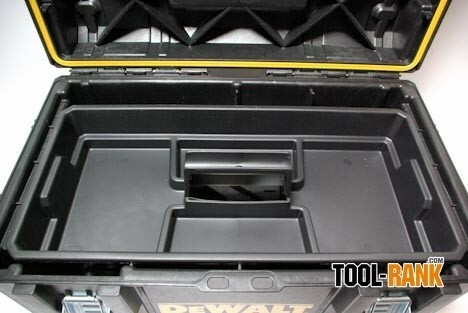 The compartments in the lid really are a bonus because its real task is to keep the yellow small parts containers neatly in place and to ensure the contents do not mix. 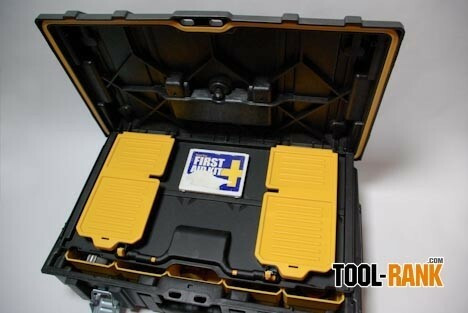 The Large ToughSystem case is almost twice the size of the small case and measures roughly 21-1/2"W x 12-1/2"D x 12-1/4"H OD. It doesn't have any of the small part containers and therefore also does not include the lid organizer, but it does include an insert tray. The tray does only an okay job at small hand tool organization. 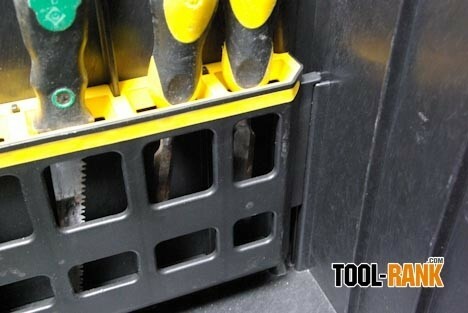 Because the tray has really short wall dividers, it doesn't do a good job at keeping tools separated to their sections. The divided sections are also too small for my needs, so the tray ends up acting like a junk drawer. 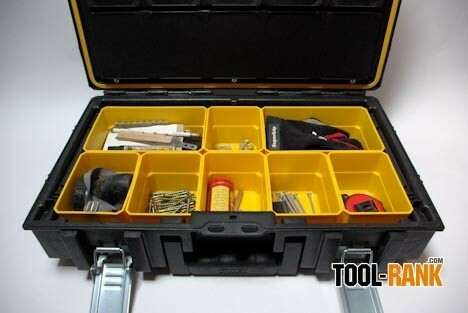 Even with the tray installed, the large case has plenty of room for my less delicate hands tools. I can keep my hammer, mallet, a number of clamps, calking gun, and more, with room to spare. It would be easy to fill the box to the point of being too heavy to carry. The Extra Large ToughSystem case is almost three times the size of the small case and measures roughly 21-1/2"W x 13-5/8"D x 16-1/4"H. You will notice that the extra large case is a bit deeper than the other cases. 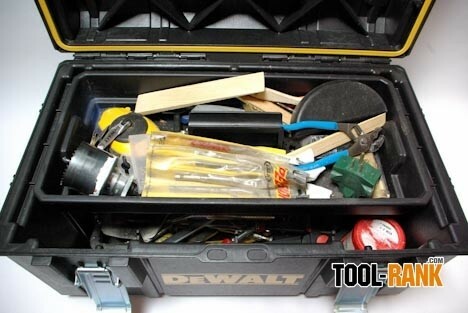 Though I use the Extra Large case for my power tools, it is the only case to feature a built-in hand tool organizer. 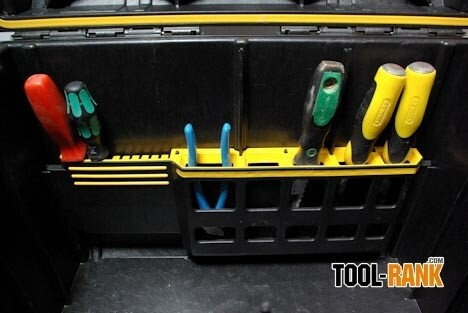 Along the back wall of the case sits the hand tool organizer which features a few different slots that can hold everything from chisels to screwdrivers. 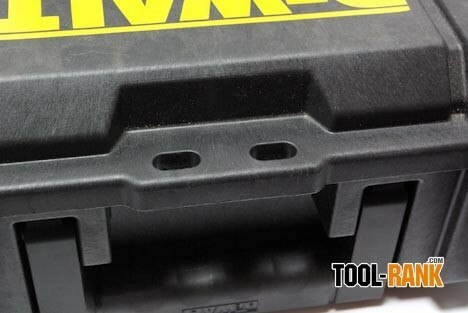 All of these slots have rubber rims that should help protect sharp tools. The side that is holding my screwdrivers actually uses little rubber fingers to hold the tools in place. These fingers can be easily pushed aside to accommodate different sized tools. 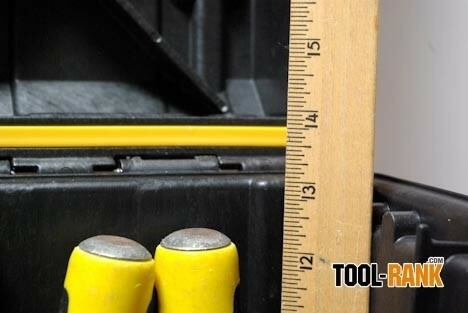 The hand tool organizer can be removed from the case if it is unneeded, or it can be moved to the Large case, though the smaller size of the large case does limit your tool lengths. 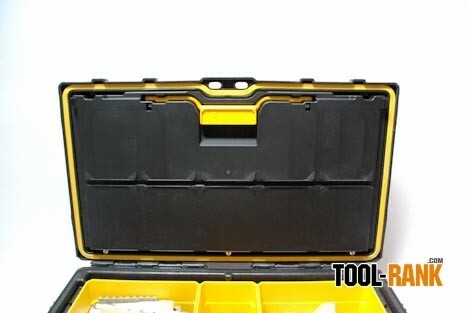 So the XL box comes with the hand tool organizer, but for the most part I use the XL case for my power tools. It is plenty large enough to handle a drill, impact driver, charger, 6" circular saw, jigsaw, and small belt sander. Tools are built to handle jobsite abuse, so I don't really worry about them riding around the same box with no padding or separation. The same insert tray that comes with the Large case is also included with the XL case, but I am not currently using it. My first reaction to seeing the ToughSystem was pretty much spot on. I have found few problems with the system, and my biggest complaint is with the insert trays. Keeping my hand tools organized is a big priority, but to accomplish this I might have to come up with my own insert. I might also try to make the boxes more secure by adding metal reinforcements to the pad lock holes. All of the boxes are priced within range of the competing modular systems ($45 - $60), but I feel you are getting a more solid box for the price. However, I do not feel the L-Cart is as good a deal. As I said above, I feel the L-Cart makes the system, but it is priced at anywhere from $170 to $250 online. Sure it is a little more complex than your average hand truck, but not that much more complex. 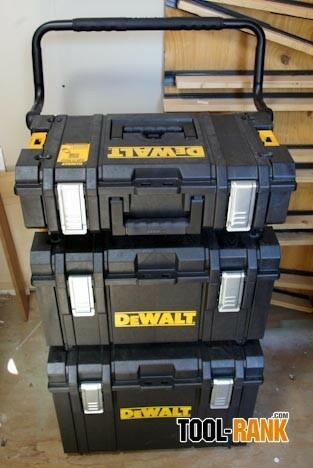 I hope that DeWalt will continue to develop and evolve the system. I would love to see them come out with some drawer options, and maybe some different insert options. 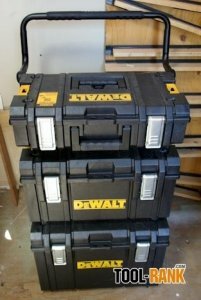 The DeWalt Tough System has been chosen as a Tool-Rank Pick because unlike other modular storage solutions it has a well thought out transportation solution. The ability to access all the boxes no matter the order in a stack is a huge plus. The ruggedness of the L-Cart is also above and beyond what other modular systems offer.